My parents chose my name because of Prospero's daughter Miranda in Shakespeare's The Tempest, although I'm sure it also appealed to my dad, the physics professor, because of its role as the name of a moon of Uranus. I saw an IMAX show at the Hayden Planetarium in the 80s that called Miranda one of the 7 Wonders of the Universe. The word Miranda is derived from the Latin word mirare meaning admire. It's the gerundive participle (future passive participle), which gives it a sense of obligation or necessity, giving the word a meaning of must be admired (thanks, Patricia Dark). It is a common surname in Spanish, probably because there is a region in northern Spain and Portugal of that name, and many towns have that name, usually towns on an elevation overlooking a river valley. Shakespeare may have chosen it as a character name after traveling through Spain (thanks, Godric Wilkie). The first documented use as a given name in English-speaking countries is 1687, but its popularity only began in the 20th century [*]. It's popular as a first name in Nordic countries. Miranda as a name for US female babies entered the top 1000 list in the 60s. 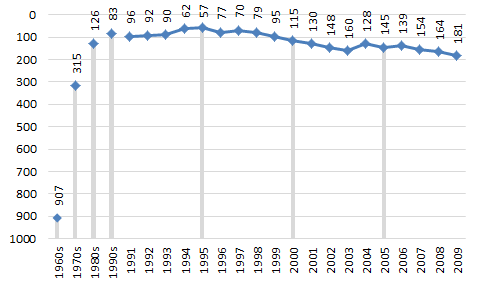 It peaked in popularity at 57th most popular in 1995 and has been dropping since 1998. Although the name has dropped as a baby name in this decade, it is becoming much more common to hear it used for characters in movies, TV shows, etc. Growing up in the 70s and 80s I never found anything pre-printed with my name on it. In the mid-90s I found a souvenir license plate printed with my name and bought it just because I'd never had anything before with my name on it. Starting in the late 90s, items with the name Miranda became more common - keychains, notepads, pens, etc. Now if I'm in an airport or gift shop and there is something with lots of names I am likely to find a Miranda item. I've had to stop buying everything I see with my name because it's too common. I'll be interested in seeing if it is dropped from kiosks as the 90s boom of Mirandas gets older, or if it continues to stay. The Miranda Rights are an important part of the caselaw in the United States, establishing that people that are arrested have the right to remain silent, and that they cannot be forced to testify against themselves. Because of my name, I have always been interested in Miranda Rights, so I have two pages devoted to the topic. Miranda Jones is a character in the original series episode Is There in Truth No Beauty? She is a blind, telepathic assistant to an ambassador, and she is played by Diana Muldaur, who would go on to play Dr. Pulaski in one season of Next Generation. Sheryl Frankin has many photos of the character. There is also a Miranda class of vessels in the series. Captain Jean-Luc Picard had a romantic involvement with Miranda Vigo, and her son Jason Vigo played an important part in the episode Bloodlines.